Natural Collagen essence penetrates into dry skin, leaving your skin with its necessary moisture and nutrition. Thanks to the Japanese for taking the bath ritual so seriously. Keeps severely dry skin moisturized and nourished long after bathing. A hard-working bath powder that smells and feels so good you won't want your bath to end - both men and women will appreciate it. Made in and imported from Japan. Includes English ingredients and usage instructions. Rejuvenate severely dry skin in a relaxing warm bath. TrueRenu has the largest selection of Japanese bath powders, milks, and effervescent bath beads online - we invite you to find the variety that is best for you, whether you want fragrance, dry skin improvement, sore muscle help, relaxation or rejuvenation! Soaking with Japanese bath salts is a wonderfully relaxing way to end the day. When it comes bath salts, TrueRenu has found few remedies better than those of Japan - the country whose culture is entwined in the daily ritual of bathing. Quality, efficacy, harmony.TrueRenu does the searching - and researching - for you. We look for hard to find, hard working products that do what they promise, and we bring them to you with detailed descriptions. 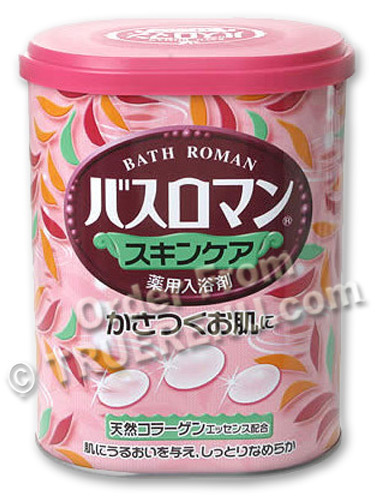 We like our Japanese Bath Roman bath salts from EARTH (the manufacturer) because they focus on benefiting the skin while in the comfort of your home, understanding how the careful combination of sodium, minerals, natural ingredients, water color and scent combined with recommended water temperatures enhance your physical and emotional well being. Try a few different varieties to find one - or more - favorites. The ideal bath water temperature for relaxing is 100.4 to 104 Fahrenheit. Your shoulders and head should be above the water level, to enjoy the full warming effect from the bottom up. Add about 20-30 grams to the water (inner ring of plastic lid is 20 grams), and relax for 20 minutes. You'll emerge from your bath feeling light, refreshed, and completely relaxed. Do not use in wood tub, or jacuzzi whirlpool type baths. Keep dry and sealed with cover - moisture can cause discoloration and degrade the fragrance of the product. Ingredients: Sodium sulfate, sodium hydrogen carbonate, collagen, fragrance, CI 45350. Product Size: Net Weight: 680g, or about 23.9 ounces - enough for 22-34 baths.